Wow! It looks so smooth and thick, exactly how I love my sauce to be! Its amazing how fresh it tasted instead of shop bought. Your tomato sauce sounds wonderful. I wish I could grow lots of tomatoes. Unfortunately, those available through my local shops are inferior. Thanks for sharing. I actually made it with shop bought tomatoes they were fine. This looks so good..Thank you for sharing! 10 bottle OMG thats a lot of sauce.You can buy a crate of tomatoes from the market , recipe works with over ripened ones also ,so often market traders sell off whole crate for peanuts at the end of trading when they won't keep for long. I bet this is so much healthier than Heinz! No additives at all!!! so really good for health. You can easily leave out the chillies totally or add a pinch of paprika instead as its not spicy. If she helps to make it you might convert her to eating fresh sauce instead of processed. The only time I made tomato sauce of any kind I left the seeds in an ended up with a green mess. Perhaps I should try again with your recipe (I'm sure my little girl would love to help me). To my knowledge this would maybe happen if you blend the seeds in tomato in a blender, this sauce was not blended but was cooked until went pulpy so was not totally smooth but It has some texture in it.If you want a smooth sauce remove seeds from tomato before chopping into small pieces. Delicious - a great way for us to use up all the tomatoes our garden produces every year! Thank you for sharing! So glad I wish I had green fingers so I too could grow my own produce. For now you can add brown sugar it works just as well. I too like to leave in the seeds of the tomato. 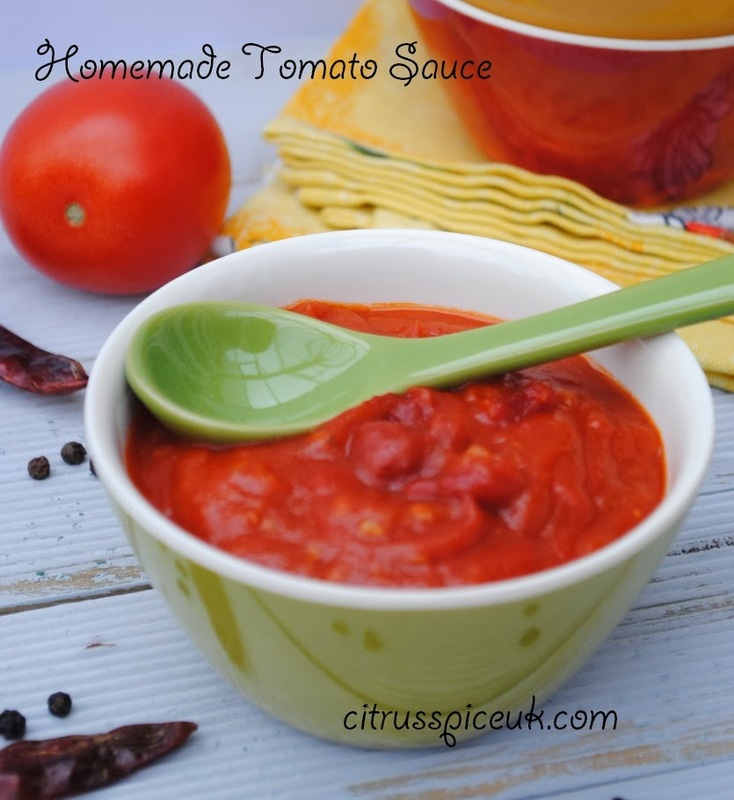 A great simple sauce to keep in the freezer to add sunshine to everything! This looks so thick and tasty. We love making soup in this house - but I haven't ever made tomato for fear of it being watery. Will definitely give this recipe a try! Thanks for sharing. Lovely looking sauce, great staple for so many dishes. Nothing beats it, but I like a lot of fresh basil in mine and a few leaves to snack on as I go. If I make pasta sauce I add basil and garlic and onions too but this one is re use as a dip and hence no other ingredients used. 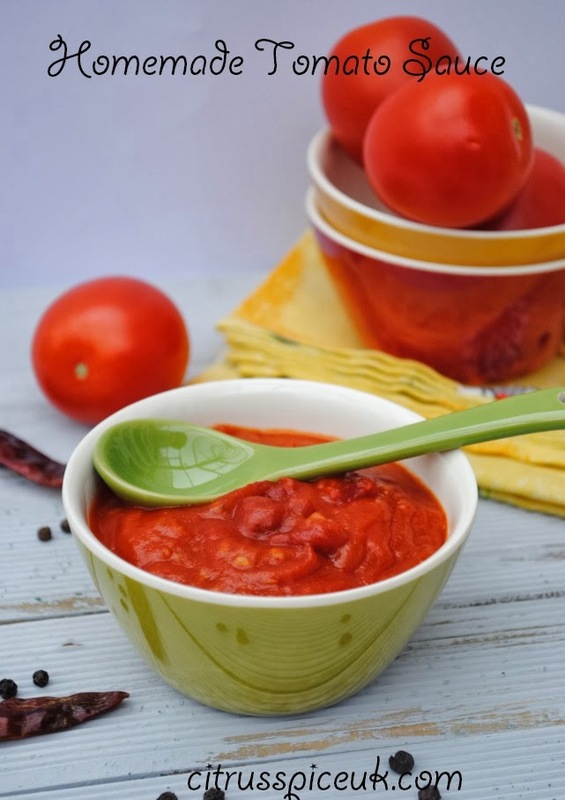 Thanks for the recipe - tomato sauce is a big thing in our house! Sounds like a fantastic recipe! Nothing beats a good thick homemade tomato sauce like this. Lush. Periodically I make similar batches of sauce, the tomatoes have so much more flavour when stewed with onions and garlic. Not done it for ages but I really should! I MUCH prefer home-made tomato sauce and often make a batch when I have a glut to tomatoes! Yours looks lovely! This looks delicious and I bet it tastes much nicer than a well known brand. I like the addition of jaggery which must bring out the sweet flavours of the tomatoes. Its really nice to use jaggery as it does give it a much richer flavour than ordinary sugar. When tommies are in seasons I regularly make a rich sauce like this, lovely plain on pasta or as a pizza topping or a base for a tomato soup. I made my own tomato sauce yesterday too. I also like to give it a bit of a spicy kick. Such a simple way to use up a glut of tomaotes. Roll on summer! I always make my own tomato sauce - but often from tinned tomatoes in winter - but never heard of jaggery. What is it? Jaggery is made of the products of sugarcane and the date palm tree. it is a traditional uncentrifuged sugar consumed in asia and africa. Wow this looks tasty and so easy to make! Another thing to give a go! So glad I found your blog through blog club! I love the sound of this, and the fact it's super easy to do too. Another fantastic recipe. 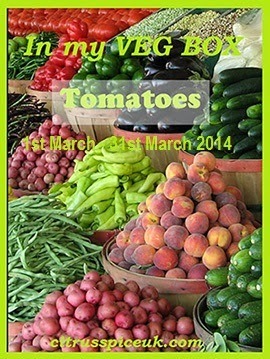 I'm sure this will come in very handy when I have a glut of home grown tomatoes later in the year. Lovely recipe and styling Nayna! Loving your table top! It is so worth is making it from scratch. I bet the taste is special too. Another great recipe to have me drooling! Have printed off to 'attempt'! I'm going to try this at the weekend. Hope it meets the burger test. Home made tomato sauce looks even better than the store bought one.. the colour is so lovely. I have actually never tried making at home.